Does this guy look cranky? I see a sort of ill-tempered look of frustrated entitlement in his eyes, but then it might just be me. He has been sitting outside my back door, singing up a storm for two hours now; hoping that I will come out yet again and proffer another morsel of mince for his impatient enjoyment. Earlier this evening, a large group of cockatoos swooped over the house, screeching and squawking and demanding my attention to the empty seed tray. Birds here in Brisbane can be raucous and demanding. And it is all my fault. It took me a year to entice the birds into my yard. First I put out seed in a tray and it stayed ignored until the rain swelled the seeds into a soggy mess. 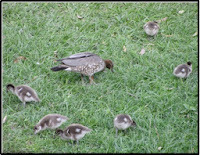 When ducks wandered across the garden and closed in on the house, I threw them some bread until they flew off in a startled huff. I left honeyed milk for the lorikeets and it dried up in the sun. When spring came and the magpies brought their insistent young to the house and accepted our proffered meat morsels, I was ecstatic. I fed them every time they came around, excited to see them. Soon the magpies told their friends, and we had butcher birds catching meat in mid-air, cockatoos congregating for noisy parties by the seed tray on our lawn and galahs and lorikeets flying in for a quick bite. 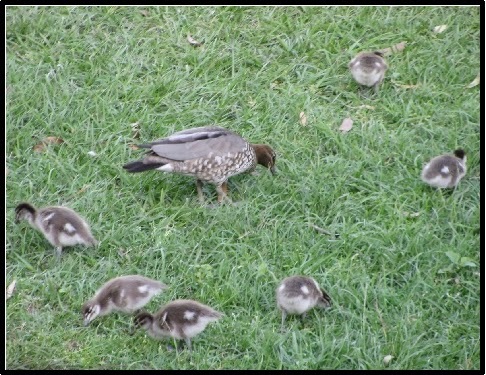 Even the ducks brought their babies by for some bread. I looked forward to my grandchildren visiting and feeding them too. I loved it but here is the problem. While the birds are sitting outside my door waiting to be fed, they are not learning to hunt and forage for their own food. I have set up an expectation. What happens if I go away for a few weeks? Could any of them die? Sometimes we have relationships in our life like this. We want to help and maybe even should help, but not for too long and not for things people can do themselves. We take away their agency, their growth, and maybe even their dignity. Children especially, need to learn to clean up their own mess, fight most of their own battles, and be accountable for mistakes. It makes them stronger and more resilient. It makes them happier people. Is there any relationship in your life where you are helping someone into dependence? Is anyone taking away your power by doing too much for you? 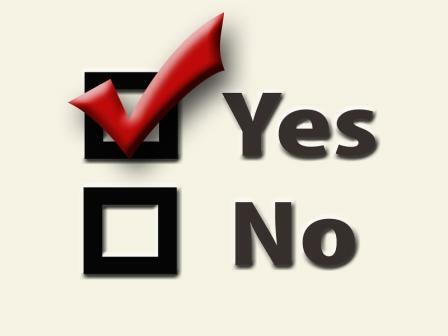 Maybe it is time to consider a small change. I still love feeding the birds but I will cut it down to once a day. 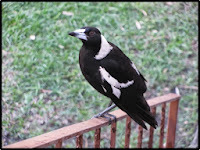 Hopefully the magpie will stop sitting around looking cranky and drop by just once a day with his biggest smile. 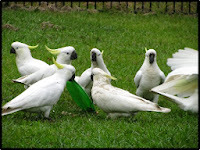 Maybe the cockatoos will stop being as demanding and go back to being playful. That would make me happy too. Happiness is Dropping off a Cliff. Last weekend I dropped off a cliff. I was attached to a yellow rope, a green rope, and a bright blue harness. It was as safe as these things can be but it was so scary I almost froze. Before I could go down, I had to back over the edge of the cliff and stand on a small ledge while I was fastened onto the ropes and then lean back into thin air and drop. It was supposed to be abseiling, but in my case it was less like sailing and more like a crab scuttling over uneven ground in slow motion. 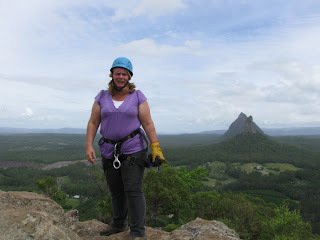 I placed my feet carefully on each small outcrop, took jerky steps, and held on to the rope so hard my hands hurt. I was so awkward that the instructor thought I was in trouble and stopped the descent. I was left hanging against the rocky cliff long enough to forget the danger and worry what my ample thighs looked like from below. As I landed, my knee hit the ground before my feet and I landed in a heap, but I was exhilarated. I felt three feet taller. Doing something tricky, scary, or challenging is a great way to improve happiness. Is there something adventurous you can do this week? Make adventure a priority. Even though I am as busy as most people, I left the house renovations and garden weeding for another day. I will remember this forever. I wish I had done more of this with my children when they were young. Keep your eyes open for opportunities for adventure. 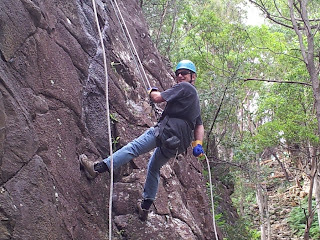 I saw the brochure for this activity at the local shopping mall and booked it straight away.Abseiling was just part of the adventure. 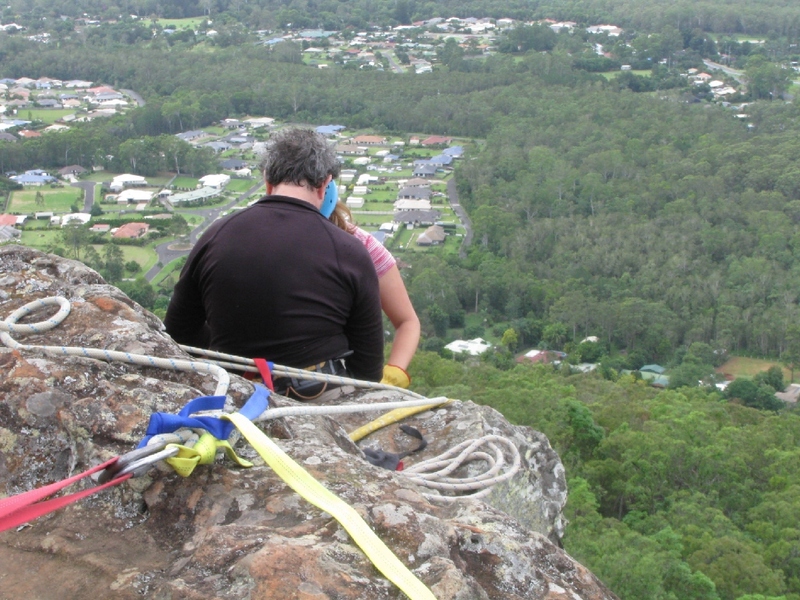 The activity took place on a mountain with panoramic views of other mountains. Double good. Be willing to take the first, sometimes scary, step, and do it quickly. I had left my bag at the bottom and suddenly I needed to get down and find it fast. Without enough time to think too hard, I just stepped over the boulders and into position without much time to think. A few of the other ladies in my group waited too long and never made it to the edge. Don’t give up. 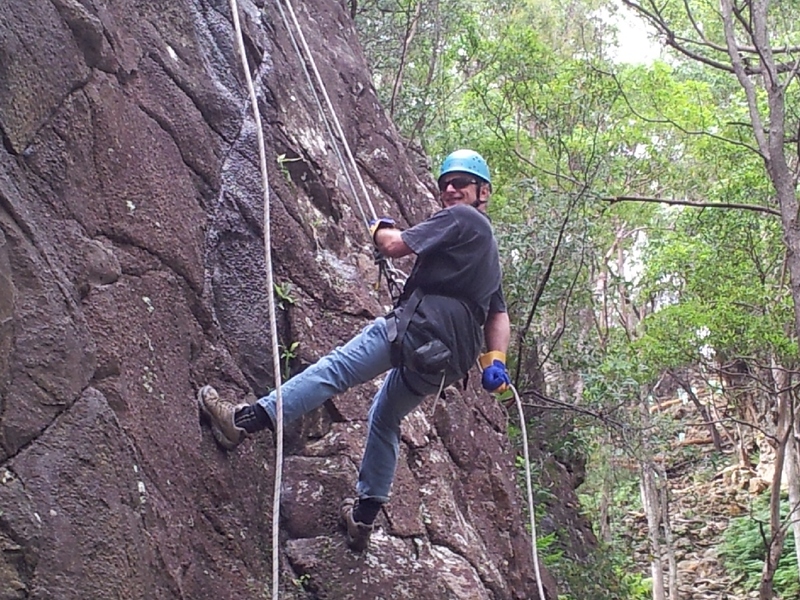 After my drop, I watched some of the men bounding down the rocks like sideways kangaroos. I want to turn my crab crawl into a bounce. 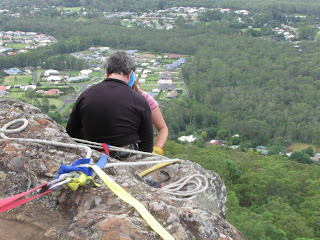 I want to go abseiling again one day. 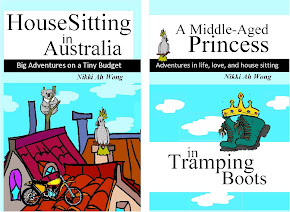 I encourage you to find more adventures to be part of and maybe you too will have more bounce in your step. Since my move to Australia, my life has changed dramatically. In New Zealand I never got bitten by paper wasps that made my skin swell into a hard red balloon shape and there were fewer mosquitos. I could sit on the grass without getting covered in ants and my legs never got covered in so many itchy red spots that I looked like a connect-the-dots puzzle. In New Zealand there were also no snakes. 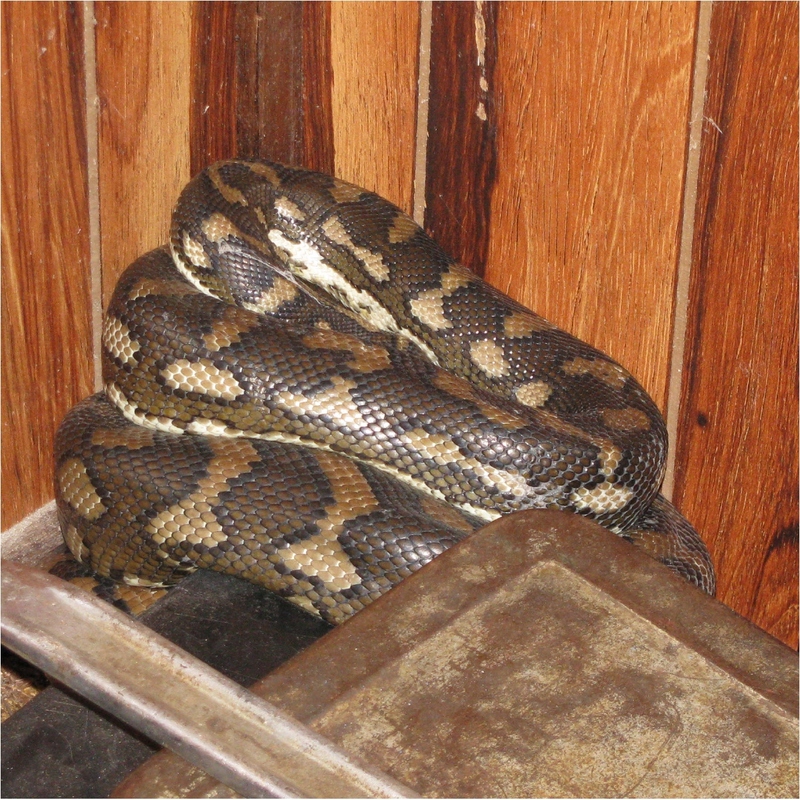 Since moving to Australia, I have had close encounters with several large snake, and last week I had a python in my living room. It was six or seven feet long, grey brown with a diamond patterned top and white underbelly. I left the door open and it must have followed the sound of my TV, right into the room where I was sitting. It then slid into a quiet corner, curled up with its head inside its body, and went to sleep. 1. Ignore it and hope it would go away by itself. 2. Learn to live with it. Find out what it eats, and what else it needs, and then make the most of having a pet snake. Of course I chose number three. We are always going to have metaphorical “snakes” in our lives, so we have to choose how to handle them. 1. Ignore the problem as much as possible. Focus on other things so as to maintain our happiness. 2. Learn ways to lessen the impact. Find out how other people cope with similar issues. Take regular breaks from the problem. Learn more about the problem. Is it as bad as it seems? Perhaps there is another way to look at it? 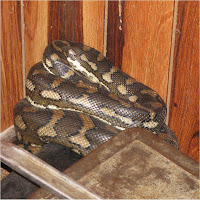 Just as many people enjoy snakes and even have them as pets, perhaps many people would be happy to have your problem. What are the positives? 3. If you have the option, remove the problem. Just don’t spend time hating the problem. It is not productive. Do something to change it, move away from it, or just accept it. 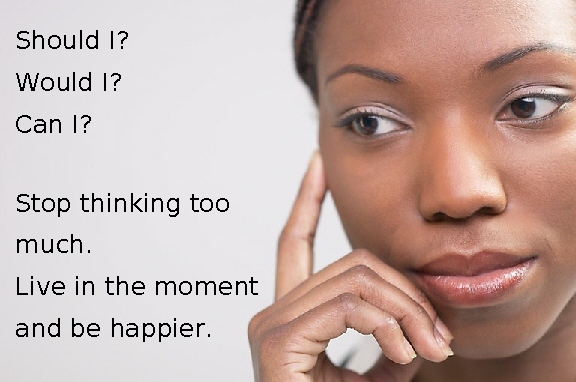 Learning to cope with life’s problems will make you happier. A friend of mine was working for a roadside rescue service when he got a call that someone had broken down out of town. It was late at night so he got out of bed and went to help. When he got there he quickly found the problem with the car and began to tell the owner what was wrong. The owner of the car disagreed. He began to argue that the diagnosis was wrong. My friend tried to explain but the customer just got more and more wound up. Finally he could not think of anything else to say, so he reverted to insults. “There is something wrong with you mate,” he said. “You’re not normal. I am and I can prove it. Can you? 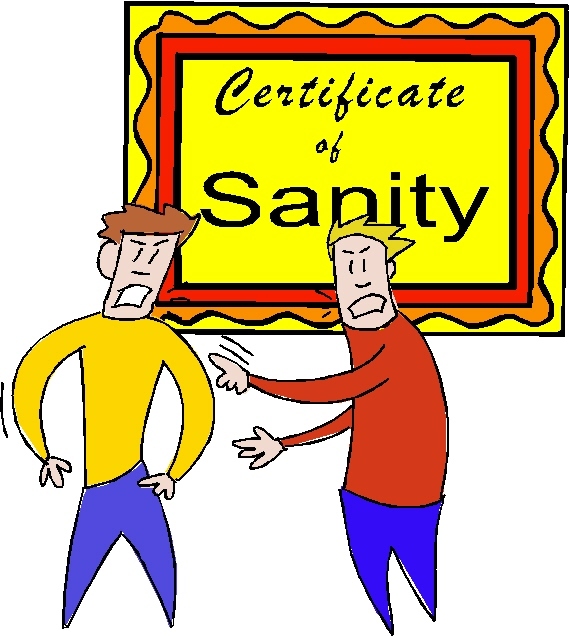 Then he pulled out a letter from a mental health institution saying he had been judged of sound mental health. I know my friend and he is the salt of the earth; kind, generous, and caring. He also likes lots of time alone and would sooner die alone than burden others with his problems. Is that normal? I have a IQ that puts me in the Mensa level but I do not have a job. Is that normal? 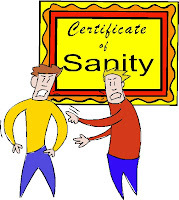 Bringing out a certificate to prove you are sane. Is that normal? It is quite normal for people to differ in their approach to life. Some people spend days dressed up as Superman, or studying frogs, or climbing life-threatening mountains. In an English court it is normal for lawyers to wear string wigs and black cloaks. In New Zealand it is normal to paint your face black and white when the All Blacks are playing rugby. As long as we don’t hurt anyone else, our unique roles, hobbies, and passions, define us and enrich our lives. Do you like music that no one else seems to like? Do you avoid parties even though “everyone else” is going? Normal is different for everyone and there is no point worrying if everyone else seems to be smarter, or taller, or bolder, or better looking, or likes different things than we do. We are who we are, and we should be happy in our own skin. It is normal to be unique, different, and maybe a little quirky. It is what makes us different, and interesting, and is quite normal… even if we don’t have a certificate to prove it. This is going to be a short, sweet, last A-Z post. How do you live longer and have more energy to enjoy it? Most of us know this list, and despite the fact that there are fads in healthy living, we know how ot be healthier. So how come we are not? 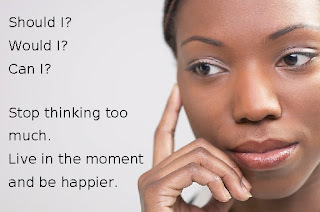 Today is a good time to choose one thing to work on. Take time each day for a walk. Cut out a mid-morning sugar snack and replace it with fruit. Seek out a nice salad recipe. There are a myriad of small actions that can make a difference in the energy we have each day. Choose one that makes you smile and start living with more zest and zeal.